Event is held regardless of weather conditions. 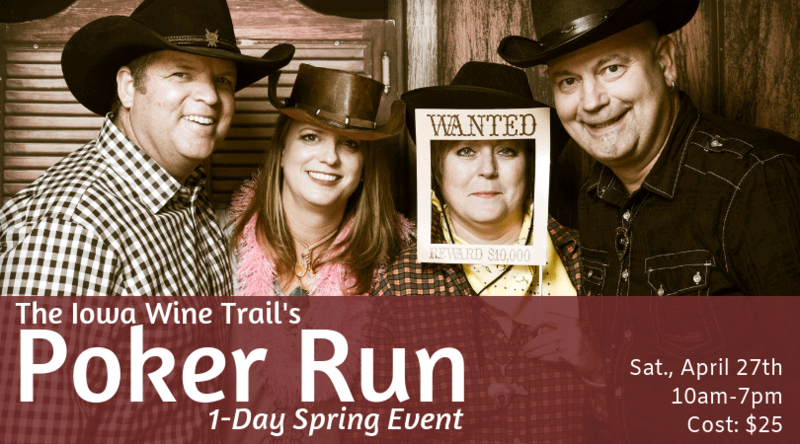 Please Note: Wide River Winery will not be a stop on the wine trail. What’s a Poker Run? It’s a fun, all-day event on the Iowa Wine Trail where ticket holders receive a poker card at each winery visited, then at the last stop of the day players will drop off their hand. The top 9 hands will win a gift certificate from one of the nine Iowa Wine Trail member wineries. What to Expect at Each Winery? At each stop ticket holders will receive their poker card, and enjoy 5 free wine samples and snack on delicious hor d’oeuvres. Plus, ticket holders who make any day-of purchases will receive a chip/token good for a future discount purchase from any of the nine Iowa Wine Trail wineries. Wild Card: As “players” you’ll want to plan your card collecting strategy carefully, for example, some wineries will offer ‘Wild Cards’ and some may offer double or nothing chances to make the game ‘more interesting.’ Whatever your strategy we encourage you to dress up in your best Casino / Wild-West outfits and have lots of fun!